That’s what a producer on Grey’s Anatomy said to me several years ago, when the show was in its infancy and I was an assistant in the writers room. I had no idea what he was talking about. “I have a what?” He pointed to the wallet I was holding, a leather trifold filled beyond capacity. I still didn’t know what he was talking about. “Seinfeld,” he said, “you know the episode with Costanza’s wallet?” And then it hit me. That was the episode where Costanza’s wallet, overstuffed with receipts, coupons, scraps of paper, and, well, just about everything besides actual money, started affecting his health. Carrying it around — and specifically sitting on it — was giving Costanza tremendous back pain. I looked down at my own overstuffed wallet. Yep. I had a Costanza. 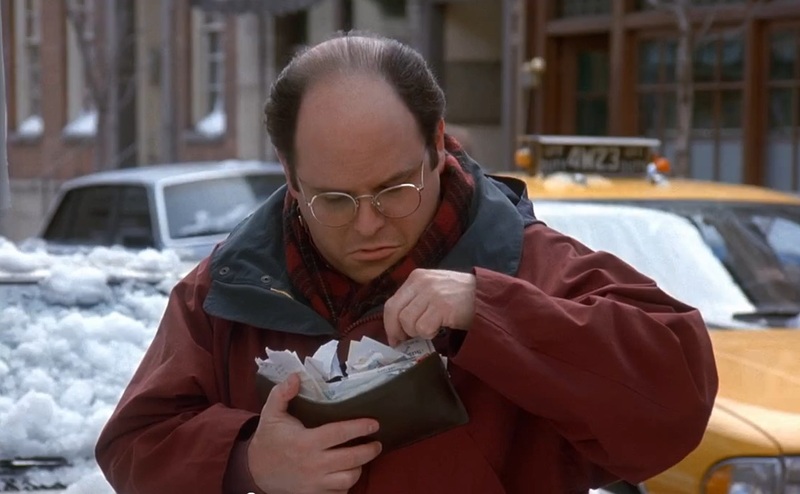 The Costanza wallet in all its glory. I became immediately self-conscious about the size of my wallet. I traded my triple fold for a double fold. But that wasn’t enough. Some time later, I traded the double fold wallet for a super-slim one that basically held an ID and a few credit cards, and that’s it. That worked well for a while. Until I lost the wallet. 1. Anxiety. 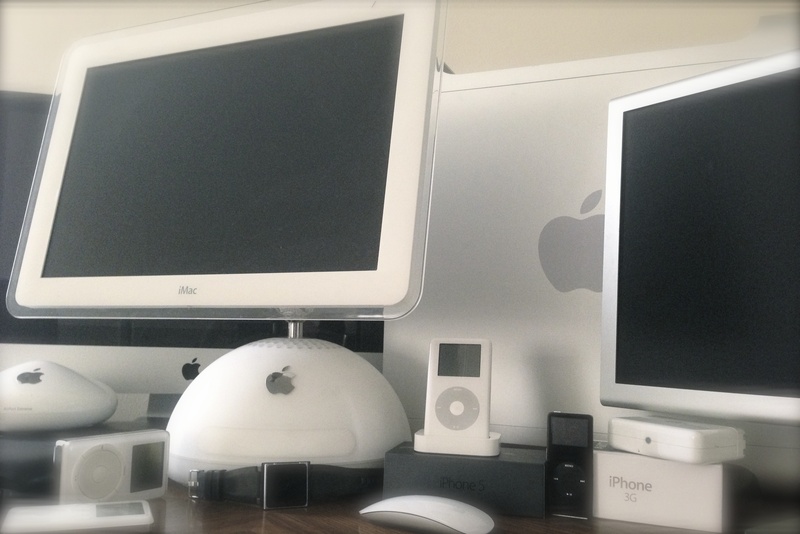 The responsibility of owning a new Apple product can seem overwhelming. How do I keep it clean? What if I drop it? How do make sure it gets fed enough data? OH MY GOD, I’M NOT READY FOR ALL THIS RESPONSIBILITY!?!?! Fret not, my friend, you are not alone. Every expectant consumer has those same questions and fears. Just take solace in knowing that people a heck of a lot dumber than you are handling the immense responsibility just fine. Oh, and use AppleCare. Despite GOP efforts to repeal AppleCare, it’s still around, and the piece of mind it offers is well-worth the cost. 2. Weird cravings. The closer you get to the due date, the weirder your desires will become. I want an iPhone 6 with a 7inch double-sided touch-screen! No, I want a 12inch MacBook Air with a retina display and a floppy drive! No, I want an iWatch big enough to mount on the wall and watch 4K 3D TV on!! Relax. The weird cravings will pass. In the end, you’ll be happy if it’s just a healthy device that isn’t delivered to the market prematurely. 4. Morning sickness. This is the sick feeling you will get the morning of the supposed product announcement, when it suddenly dawns on you that you have absolutely no idea what Tim Cook is about unveil. Sure, it could be a cool new phone. But it could also be a blender. In one fateful breath, you will realize that no one on the internet knows anything. You’ll suddenly notice that every “exclusive report” on every website purporting to know what Apple will release is based on the same “anonymous sources” with specious connections to “overseas suppliers.” Same for all the self-proclaimed Wall Street Analysts who cherry-pick from said reports to make whatever “bold prediction” will get them airtime on CNBC. And, of course, when the spurious predictions turn out to be bunk, they shirk responsibility and act like it’s Apple’s fault. (I’m looking at you, Gene Munster, senior analyst at Piper Jaffray, and the Apple-branded HDTV set you’ve been predicting as “imminent” every year since 2009.) Sorry, got off on a tangent there. Where was I? Oh yeah, morning sickness the day of the product announcement. Try to get plenty of rest the night before, avoid greasy foods when you wake up, and take it easy on the coffee. Also: Don’t believe anything you read about Apple in the days leading up to unveiling. 5. Messiness. Once the mucus plug of consumer innovation finally spills its contents, the internet will become a messy, messy place indeed. Best to stay off social media for at least 24 hours, until the backlash and the backlash to the backlash have subsided. All that really matters is the, um… lash? That doesn’t sound right. But let’s go with it for now. 7. A growing distance between you and your Apple-less friends. It’s a sad fact of life: Once you become an Apple household, you simply won’t be spending as much time with your non-Apple-having friends. You will get new friends, though, and they will be much more awesome than your old friends. They are called Apple Geniuses and they are available by appointment only. 9. Ennui. This is the inevitable sense of boredom that will overcome you. Life’s old pleasures will cease to have impact. New pleasures will emerge, but they will pass quickly. The rush you felt the first time you unlocked your phone with nothing more than your fingerprint will be long gone. All that will remain: A hole in the center of your being, filled with the dispiriting notion that your new Apple product will one day be obsolete. As will you. 10. Wonderment. You will wonder what happened to the whole iDevice-as-a-baby metaphor. You are probably already at this phase right now. 12. Mutual respect, deep-seated appreciation, and a Hollywood ending. Sure, the novelty of your new Apple product will wear off. Siri’s limitations will become readily apparent. The device’s heft and quirkiness will become more pronounced as it ages. Curiosity will lead you back to Windows or maybe over to Android or one its many variants, but the experience will be painful, oh-so-very-very-painful: Why does this Windows 8 computer have two separate interfaces that DON’T WORK TOGETHER AT ALL? Why can’t this brand new Android phone be updated to the latest Android OS? Why does this Amazon device seem to be designed solely to get me to spend even more money on other stuff? And you’ll find the only thing that will relieve the pain is your once-new-but-now-old Apple product. The one you came this close to selling. You will apologize to it. You will hold it close, caressing it with tenderness. You will promise never to abandon it again. Well, at least not until the iPhone 7S comes out in 2017. According to the internet, it’s going to be so freakin’ awesome!!! For the movie rights to this post, please contact @ericbuchman. All I ask for is casting approval, final say on the script, and payment in German bearer bonds.